A few weeks ago, I told you about a girl in California that wanted you to support hate, bigotry and closemindedness by NOT buying Girl Scout Cookies this year. She wanted to send a message to the Girl Scouts of America that treating a transgender seven year old girl with respect, love and support was wrong. Daddy would like your help in sending the opposite message - any organization open and intelligent enough to set aside byzantine stereotypes and fears - any group that chooses instead to support a child that many in our society would completely shun (on a good day) - well son, that group gets Daddy's Seal of Approval. That group gets Daddy's cash. I'd take a cookie for that group. 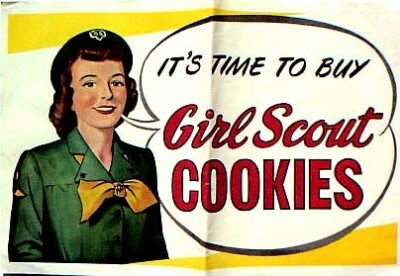 I hope you will all join me in making this a record-breaking year for Girl Scout Cookies sales. Now, I know there's a lot of us that have sworn off sweets, and I don't want anyone to have to compromise their convictions. Luckily, there's a way you can support the GSA and our US Armed Forces, and you don't have to let one Thin Mint pass your lips. DVIDS reports that United States service members recently got a taste of home with cookies donated by Girls Scout of Hudson Valley, N.Y., through Operation Cookie Drop. Operation Cookie Drop began in the wake of the aftermath of 9/11. Girl Scout communities all over the Hudson Valley began sending cards, letters and boxes of Girl Scout cookies to as many servicemen and women they could. The project began with 36 girls and 111 boxes of cookies and has now expanded to 849 girls and 56,000 boxes of cookies. Girl Scouts along with 25 sailors from Fort Dix, N.J., helped package boxes of cookies in preparation for shipment to troops serving overseas. The cookies were donated by customers who wanted to send cookies to the service members stationed overseas. In addition to the 56,000 Girl Scout cookies shipped to Kuwait, 1,000 boxes went to Walter Reed Hospital in Washington D.C. for wounded warriors, 2,000 boxes went to Stewart Air Force Base, N.Y., to be flown out to Iraq and Afghanistan and 1,500 additional boxes were sent out by local Girl Scout communities to soldiers from the Hudson Valley serving in Iraq and Afghanistan. Pretty Cool, huh? You can support the GSA, support the troops, and still maintain that New Years Resolution. All of the Good and none of the Guilt. I love it. Another way you can show your support is through a group called TransYouth Family Allies. This group now features a Transgender Girl Scout Support Page. From there, you can learn more about this issue, donate to the Girl Scouts of Colorado or donate to GSA Colorado's "Power Up" program, which now has new LGBT anti-bullying support included in the curriculum. Help the Girl Scouts out this year. It's the yummiest Good you'll ever do.